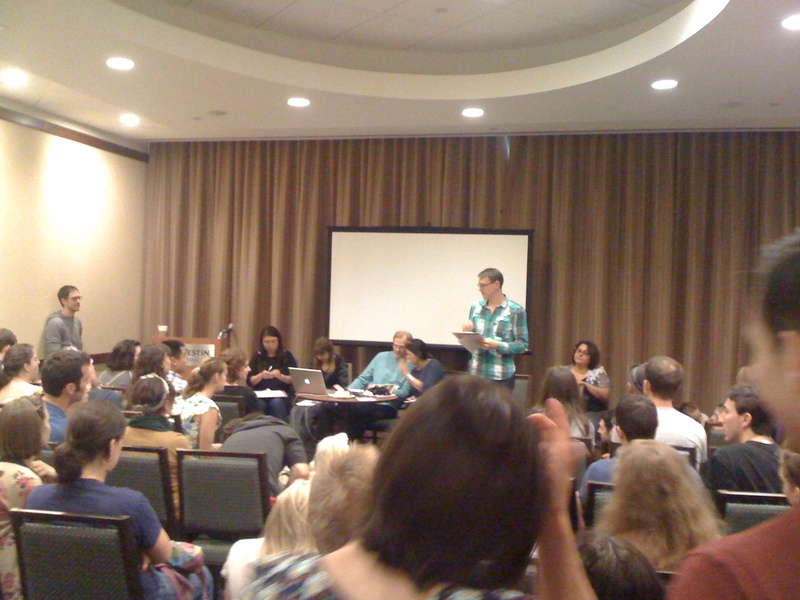 In spite of a hurricane and an earthquake, ILHC 2011 pressed on this past weekend in Alexandria, Virginia. With attendees from over 20+ different countries this year such as Lithuania and South Korea, ILHC lived up to its name as an international competition. There were mind-blowing competitions, talks that had delightful stories about the history of our dance in the 80’s & 90’s, and a social dance experience that one would be hard-pressed to find anywhere else in the world besides possibly Herräng. Instead of my traditional breaking down of events by usual categories, I am instead going to post about a few of the highlights of the weekend accompanied by photos. I think Baltimore’s motto should be, “There will be mayhem!” because they always deliver. I got a text this past Saturday night from a Baltimore friend listing a room number and the time of 7:00 PM. I show up, this is what I stumble into. 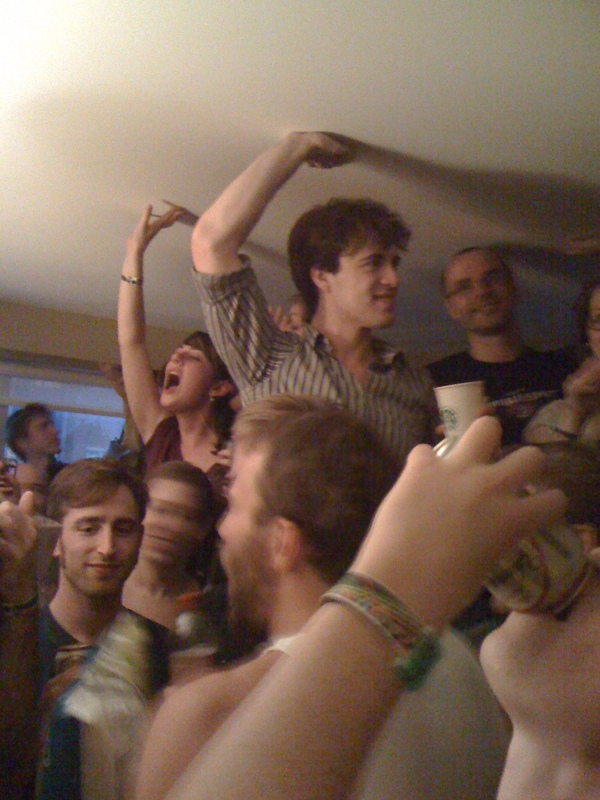 During the party was impromptu group singing, people being crowd surfed, and fun times for all. More importantly though not just during the party but the entire weekend during the competitions Baltimore seemed to carry this high energy attitude. It was contiguous and seemed motivated people in other scenes to cheer hard for their local dancers as well. I had the opportunity to attend eight LED talks this year and thoroughly enjoyed each one of them for different reasons. The two talks that stuck out in my mind though were Steven Mitchell and Lennart Westerlaund’s talks on their experiences of discovering and learning Lindy Hop in the 80’s and 90’s. They went into detail about of their separate discoveries of Al Minns and later Frankie Manning. They both also gave insight to how the culture and education of the dance at their respective time was worlds apart from how Lindy Hop is today. I can only glaze the surface of how awesome these talks were, but I hope to have time to go into further detail about of them in a future post. Just because the DJed music stops at ILHC, doesn’t mean all the music has to stop. 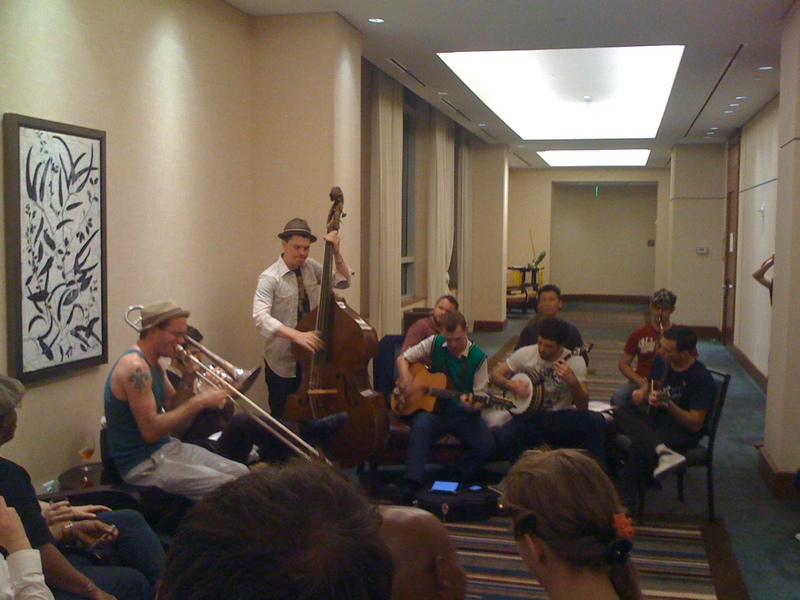 What I loved is seeing Saturday night an impromptu band break out. In addition the next morning two violinists and a cellist were playing some tunes and entertaining those of us not taking classes before the competitions. I’ve been noticing this trend of more dancers bringing their instruments to events, or in some cases learning how to play with others and I hope this continues. Seeing Kevin St Laurent and Emily Jo Hoffburg make good on their promise to Baltimore at this past Lindy 500, that if they made the finals of the Champions Strictly Lindy they would crowd drive their cheering section. Watching Skye Humphries and Frida Segerdahl tear it up in the Champions Strictly Lindy with solid dancing and not needing any tricks or flash. Showcase Division – Michael Darigol & Brittany Johnson threw down with badass swingouts and the crowd went insane. Seeing friends from my home turf (Southern California) come out in a horde and throw down in the competitions. Special props to the Fly Rghts for performing not once, but twice in the team division. The junior division this year was inspiring, it gives me a lot of hope for the future of our dance. I’ve been doing the usual stalking browsing of Tumblr/Facebook and the rest of the internet for other perspectives on ILHC. But oddly its mostly just people watching videos of the event and their reactions to it. The rest of you folks that attended (I know there are at least 799 of you) either in the comment section or elsewhere, share your experiences of what ILHC was like. I’m curious. This entry was posted on August 30, 2011 by Apache. It was filed under Dance, Lindy Hop . I may write something longer once I’ve had time to think about it, but this was my first time at ILHC, and my experience was that it was incredible. The event was well-run, (and amazingly on-time, huge props), the competitions were inspiring, the energy was intense, and the social dancing level was very high. I am, in fact, still high off of it. And I kinda wanna move to Baltimore.